Innocent Venus is set in the not so distant future that portrays the Earth as a devastated planet. Plagued by hurricanes across the globe and leaving the planet in an almost catatonic ice age, the world's governments have relatively crumbled and new factions have merged. Although Europe and the US are in chaos, Japan has almost recovered from this disaster, thanks to the futuristic technology. With rebellions igniting across the country, two men Jin and Joe have been given the task of escorting a young girl named Sana across this ravaged land. Even the story reeks of stock standard Japanese anime, it's easy to be drawn into the unique story and likeable characters. 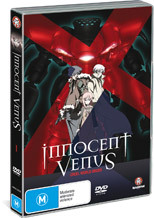 The first volume of Innocent Venus contains enough twists, thrills and some brilliant battle scenes that will have some anime lovers wanting more and fortunately there are more DVD's to come. The creators of Innocent Venus should also be awarded for their visuals which is truly eye candy with its basic yet detailed animation that is matched with a wondrous colour palette. Entertaining, although quite clichéd!